Our company is the proficient manufacturer of dough moulders. S.S rolls are used in the manufacturing and designing of three stage sheeting moulder, which enables the moulder to operate at high speed. The dough moulder gives the exact and desired moulding operations. The machine offered by us is equipped with sunmica surface pressure board which allows the dough to be moulded uptill the length of 4 inches. It is designed for continous and uninterrupted operation at high speed and for perfect speed and for perfect moulding action. In Moulder three stage sheeting is accompalished by effective use of perfectly machined and precisely adjustable S.S rolls. It is capable of moulding dough place upto the length of 4" for the purpose of twisting, a sunmica surfaced pressure board is provided. 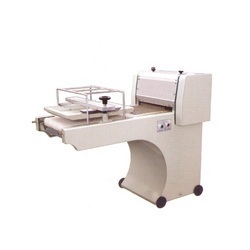 Looking for Dough Moulder ?